To date, Billabong has saved order 37 million plastic bottles from the ocean. What did they do with them? They made pants! Plastic pants. Well, plastic swimming pants, aka board shorts. It takes 10 bottles to make 1 pair of board shorts. Since you were about to ask if they felt like a bottle of Evian against your leg, the answer is no. 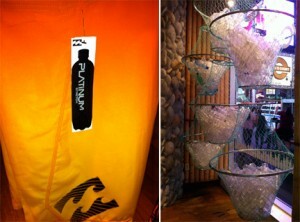 They are comfortable, stretchy, cool looking, and a great use of the $11 billion dollar waste industry, plastic bottles. Kudos to Billabong for making the world a better place. Now if I could only get a pair of those orange board shorts! I waited too long and now they were all purchased. Great job making products that people love. Fantastic website you have here but I was wondering if you knew of any community forums that cover the same topics talked about here? I’d really like to be a part of community where I can get advice from other experienced individuals that share the same interest. Thank you! What type of scheme? Great to hear, and best of luck.